For anyone involved in maritime training, now is an incredibly exciting time full of opportunity. More than ever before, there are new advanced techniques and technologies available that can significantly improve training outcomes and access to training, while keeping costs under control. Properly deployed, these advances will improve safety - on that, the research is very clear. This article looks at training in the maritime industry and predicts how the advances will change training over the next 5 years. We are in the fortunate position of being able to say that the maritime industry is beginning to embrace the fact that training can indeed be improved - the “old” way is not always the “best” way. Now that we are on this path, there is no turning back in the face of improved outcomes. What changes will we see in maritime training over the next 5 years? There are many, but space is limited so we will focus on a few of the most notable. It is easy to argue that the biggest advance in training in the last 20 years has been blended learning. Blended learning means using more than one technique for training delivery. It is just beginning to take hold in the maritime industry and I suspect it will be the biggest story in maritime training over the next 5 years. In practice, blended learning usually means combining on-line learning with face-to-face learning. There are many ways to “blend” the learning experience, but let’s look at one model - that of using on-line self-study as a precursor to classroom or on-board training. This is an incredibly successful model that has been proven in thousands of studies to significantly improve training while at the same time being reasonably inexpensive and easy to implement. It is easy to understand how it can be helpful. Imagine a vessel familiarization course which begins with some online self-study followed by on-board instructor-led training. The on-line study would likely focus on foundational knowledge about the vessel, equipment, layout, routines, and so on. The instructor-led on-board training would then continue the process by developing the hands-on experience and skills to complete the learning. There are many advantages over conventional training. First, the initial portion, being online, is very “trainee centered” meaning candidates can proceed at their own pace and on their own terms - increasing the likelihood that they will learn the required knowledge successfully. It is also a fortunate coincidence that on-line training can be comparatively inexpensive, especially since the need for travel is eliminated. Second, the on-line portion is guaranteed to teach company-vetted best practices. Most other forms of training, whether they are classroom or (especially) job-shadowing, are subject to a wide degree of variation according to the personal experience, biases and abilities of the instructor. This lack of standardization can be dangerous in a safety-critical environment such as the maritime industry. Online training means you are in control of what is being trained. Third, when the candidates arrive on-board or in class for their instructor-led training, all candidates now have a very uniform level of knowledge. This allows the instructor-led training to be much shorter because the “knowledge” portion of the training has already been covered. Secondly, the instructor-led training is far more efficient because the instructor has less variability to accommodate in the trainees. If the maritime industry follows the successful path of higher education and other industries (and I see no reason to believe it will not), then blended learning will be a huge story over the next 5 years. ● Or even performance segmented by employee background (determine which kinds of backgrounds yield better performers). The point of knowing this type of information is two-fold. First, it allows you to find hidden training problems before they become performance issues or, worse, an accident. And second, knowing these numbers allows you to apply changes to your training and then determine whether the change made a positive impact. This is the essence of continuous improvement. Without it, you are shooting in the dark. In the past, these analytics have been very time consuming and expensive to calculate and maintain - so very few organizations (aside from the most safety conscious) took the time. Now, however, sophisticated on-line training tools called learning management systems (LMS for short) provide a broad set of actionable analytics. So as LMSs continue to spread throughout the maritime industry over the next five years, analytics will help to transform training training insight and sophistication. Every vessel is a world unto itself - with different equipment, different routines, different layouts, and even different corporate and flag-state regulations. So the training for personnel on any vessel - especially familiarization training, is by necessity unique to that vessel. Until recently, the only way to accomplish this efficiently is through job shadowing - a staple in the maritime industry. Sadly, job shadowing is one of the worst forms of training. It is difficult to standardize, almost impossible to measure, and highly variable in its effectiveness. Fixing these issues requires the creation of company-vetted, best practice training resources and programs for every vessel in your fleet. That would be a very daunting and expensive process - both in terms of the initial creation and the maintenance. Fortunately, a relatively new technique called “adaptive learning” can help to solve this problem. Adaptive learning is a feature of some learning management systems. In essence, adaptive learning tailors the training program to each individual trainee - automatically. An LMS which supports this feature asks the trainee what role and vessel they are training for, and then automatically creates a set of company-vetted learning materials from training materials in the database. Each trainee receives an online, custom textbook targeted to that trainee. Adaptive learning has been in use in other industries to varying degrees and is already in use by some safety-conscious vessel operators. No other industry that I am aware of can make use of this feature as effectively as the maritime industry. Therefore, adaptive learning is an important innovation to watch over the next 5 years. This is an incredibly exciting time in maritime education. Change is afoot - and there is a formidable arsenal of tools waiting to be deployed for the benefit of safety in our industry. 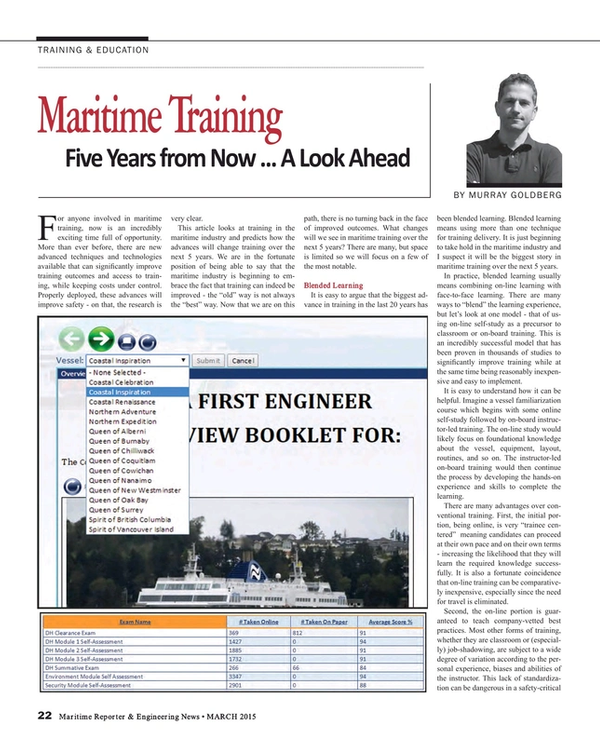 As indicated in the introduction of this article, if you are involved in maritime training in any way, it is time to take a hard look at your training practices because there are advances available that can significantly improve training outcomes, performance and safety.